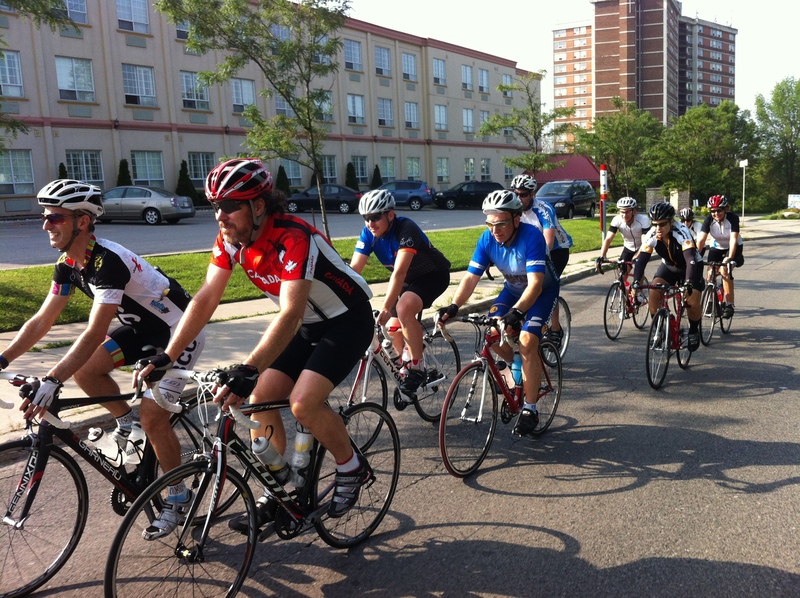 Keep the pace: As you're riding through the line, pay attention to the group's average speed and effort. When you get to the front, do your best to maintain those levels—do not speed up. Do not simply focus on the wheel directly in front of you. Look ahead and beyond the rider in front of you. Keep your head up and check about 10 meters down the road. Look through holes in the leading rider—over his/her shoulder, under the arm or around the legs. Do not stop pedalling when on the flats or slight downhills, even when getting too close to the wheel in front of you. (Just faux-pedal, not actually applying pressure to the crank, but keeping your legs moving). Why? Two reasons: (1) when you stop pedalling, the rider behind assumes you are slowing down, does the same, and must work harder to catch up when you resume pedalling, (2) it’s easier to resume speed if your legs are already in motion. If you do need to slow down slightly, here are two suggestions: (1) "aero"brake by sitting up or (2) feather brake—gently squeeze the brakes while continuing to pedal. When relinquishing the lead, and pulling off to the side, do not stop pedaling. Simply move to the left (or right) based on the agreed direction and pedal slightly slower until you reach the back. When pulling (leading) after a stop, proceed slowly enough to allow everyone to regroup. Do not jump-start; look behind you to ensure all riders have regrouped and then accelerate. Similarly for climbs or descents—regroup on the flats. Do not hog the pulls. If there are many riders, just take 45-60 second turns as lead. If you are the strongest rider then others may allow, or even request, that you pull more. It’s then your decision as to when to drop back, but save your energy on long rides. Pull off into the direction of the crosswind. If there is an echelon, move back behind the group so as not get to in their way. NEVER OVERLAP the wheel in front of you. You cannot predict when the rider in front may need to move laterally due to an obstacle or to avoid the rider in front of them.